David Sobolov is known for his work as a voice actor playing creepy villains, scary aliens, and edgy heroes on television, in games, and in feature films. 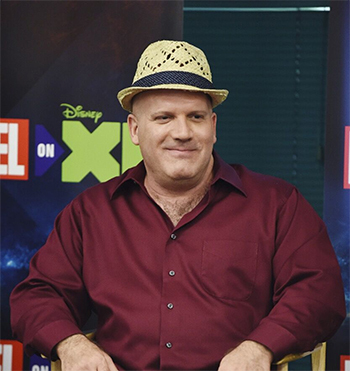 He’s the voice of Gorilla Grodd on The CW Network dramas The Flash and Legends of Tomorrow and Drax in Marvel’s Guardians of the Galaxy animated series on Disney XD. David is the voice of Shockwave on Transformers Prime, Azmodan in Heroes of the Storm (and two previous games) for Blizzard, Dr. Fate in Injustice 2, The Arbiter in Halo Wars, and Lobo on WB’s Young Justice and the game Injustice: Gods Among Us. Sobolov was the voice of Depth Charge on the classic Beast Wars Transformers series, Tatsurion the Unchained (aka Bob) on Kaijudo, Lt. Vasquez in Call of Duty 4: Modern Warfare, Jul M’Dama in Halo 4, Dr. Garret Bryson in Mass Effect 3, Robocop in Robocop Alpha Commando, Lord Tyger on Spider-Man Unlimited, and Spookie Jar on Sabrina: The Animated Series. His face and voice were featured in the on-camera performance capture role of Rios in Army of Two: The Devil’s Cartel for EA, and in the feature film Sparks. You’ll hear Sobolov speaking German in the first Call of Duty game, and Klingon in Star Trek Into Darkness. Sobolov studied acting with the legendary Sanford Meisner at the Neighborhood Playhouse in New York.